Uniting modern style with ancient craft, we created our 12 ounce copper Moscow Mule mug in the social spirit of enjoying your time and company, the ritual of mixing your cocktails and serving your guests. Our superior quality offers you long lasting beauty with a durable shine beaten into our heavy gauge hammered copper. 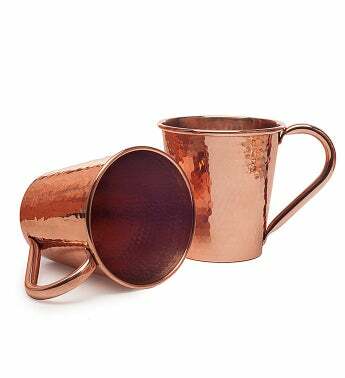 Copper handle, 12 fluid ounce capacity mugs. Pure copper from 100 percent recycled sources. Copper handle tig-welded to the body. Heavy gauge material made to last for generations.